County Highway S-2 is a desert road in south-central California with a fascinating history. Beginning at California Highway 79 near Warner Springs, the road leads south through the Anza-Borrego Desert in the Anza-Borrego Desert State Park. Known as the San Felipe Road, it is also known as Sweeny Pass, Imperial Highway and Great Overland Stage Route of 1849. The winding S-2 passes through Box Canyon and leads to the community of Ocotillo at Highway 8. Alongside the roadway the soft desert sand, rocks, ruts, and cacti provide a glimpse into the past and the difficulties that plagued wagon wheels and horses hooves. Highway S-2 dates back to the late 1700s when, as a dusty trail, the Spanish used it. In 1826 it was Mexican mail route. Writer Mark Twain described riding in the coach as a "swinging and swaying cage" and "an imposing cradle on wheels." Famous people also used the trail, including Kit Carson and General Stephen Kearny, who led the Army of the West to war with Mexico. Mark Twain also rode the trail in a mail coach with his brother Orion, and wrote about it in his book Roughing It (1872). In 1861, his brother had been elected Secretary of the Nevada Territory and they left St. Joseph, Missouri, for the trip west. Passengers were allowed only 25 pounds of luggage with the coach carrying 2,700 pounds of mail. Travel by stagecoach, with the exchange for fresh horses at various stops along the way, provided a fairly quick journey for its day. However, travel without pavement was a rough ride. 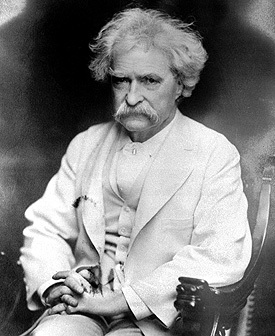 In Twain’s descriptive and amusing writings that rough ride comes to life. He describes the coach as a "swinging and swaying cage" and "an imposing cradle on wheels." He continues, "When we flew down one bank and scrambled up the other, our party inside got mixed up. First we would all lie down in a pile at the forward end of the stage, nearly in a sitting posture, and in a second we would shoot to the other end and stand on our heads . . .The pistols and coins soon settled to the bottom, but the pipes, pipe-stems, tobacco and canteens clattered and floundered. . . spilling tobacco in our eyes, and water down our backs." The trail became a road when the steep walls of Box Canyon blocked the Mormon Battalion, the only religious "unit" in American military history serving from July 1846 to July 1847 during the Mexican War. Using the hand tools they had with them they cut a passage large enough to let their wagons through. Thus, the first road into the interior of Southern California was created and became known as the Southern Emigrant Trail. In the 1850s, Gold Rush miners and numerous others, including the Butterfield Overland Mail, traveled through Box Canyon. And finally, modernization reached the desert-the road was first paved in 1929. 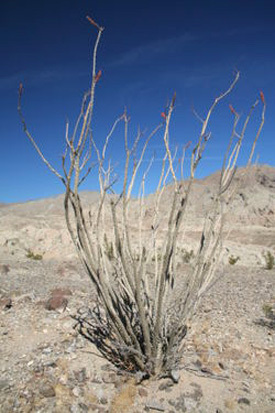 The Ocotillo is a common sight on the southwestern desert, blooming with bright red flowers in the spring and summer. In 1930, Marshal South, artist and also author of western books and a regular column, "Desert Refuge" for Desert Magazine, moved with his poet wife, Tanya, to Ghost Mountain, not far from Highway S-2 where they built an adobe cabin. They had a family there and lived a primitive lifestyle in tune with nature, with Marshal recounting their experiences in his column. The couple stayed at the cabin until 1947. The ruins of the adobe cabin stand today (http://www.desertusa.com/mag99/mar/papr/mtsouth.html). Now named California Highway S-2, this historic road lies within the Anza-Borrego Desert State Park (http://www.anzaborrego.statepark.org/aboutthepark.html). Maps and the usual tourist information is available to anyone attempting to go back in time and experience the trail of the Great Overland Stage Route as it was in its beginning.